I read about this project the other day called Mars One. The project involves setting up a colony on Mars for four people to live on by 2025. Getting to the moon is hard enough. It takes like a day and a half of travel, landing is hard, getting off again is hard, and landing safely on Earth is even harder. NASA and other government space programs have always avoided going to Mars for two reasons. #1 With our current rockets it would take about two months to get there. Spend a week there and two months back, you need four months of oxygen. It’s not possible to transport that much so you need to recycle your air and that gets complicated. Plus there’s all the extra food, water, and fuel you’d have to bring. #2 With that two month journey its even harder to get back. We can land drones on Mars, but we can’t bring them back. Mars One plans to get around the first problem by establishing a minor space colony first, while also working with robots to establish a little base camp on Mars. The second problem is tackled by… not bringing the humans that are sent there back to Earth. That’s right, Mars One is a one way trip. That’s where the name came from (I think). There’s a lot of logistical problems with that. I’ve casually mentioned a few (sustainable food, water, air, fuel). I’m sure there are more. Another problem is who would want to go on a mission like this? It’s almost certainly going to have problems that could kill you. Even if it doesn’t kill you, you’re stuck on Mars for the rest of your life. Maybe more people will come later, but that’s doubtful. Well, Mars One asked people to apply for their one way trip to Mars and got thousands of responses. Those responses have been whittled down to one hundred people. The next step is to whittle that one hundred down to four via, get this, a reality TV show. This was the point where I stopped taking Mars One seriously. I looked into it a little more. Mars One is a non-profit. The project is supposedly only for the advancement of space travel. And it will help with that at least through gaining public attention if not by developing equipment for Mars colonies. There’s also a for-profit company attached to Mars One called the Interplanetary Media Group. That company is the one releasing a bunch of press and making the reality TV show. They’ll probably make a ton of money off of that. Is that money going to go towards funding the Mars trip? Maybe. Is it going to fund the construction of beach house real estate for the owners of these two companies? Maybe. And the weirdest thing about all of this? Even though the reality TV show seems like an awful interview process, I’m still interested in watching it. A previous experiment for this, Mars-500, simulated people going into a spacecraft to Mars for 500 days. Cut off from the outside world the people in the mission pretended to do all of the things necessary for going to Mars to see how they held up mentally when they were forced to be in the same “spacecraft” for a year and a half. Mars-500 was a success, but possibly only because it was fake. As a psychological study you have to give people the option to opt out at any time. That wouldn’t be the case in a real space flight. My point is that the training process for Mars One has to be similar to Mars-500 and I’m excited to watch that. Plus I might get to vote people out the airlock or something! PS. And here’s what Neil deGrasse Tyson has to say about it. Here it is almost two weeks later and I still haven’t made a post about my awesome Valentine’s date! My wife and I went out to eat at her favorite restaurant, Chevy’s. She likes the place a lot because they have really good tortilla chips and the family friendly atmosphere is very inviting. After the wonderful dinner we used a birthday present I’d gotten for her back in November, tickets to Disney on Ice! The opening act was a few ice-skating boomerang throwers. Mickey came out along with all of his friends who wanted to throw a birthday party for somebody, but it wasn’t any of their birthdays! The Mad Hatter came out along with Alice and suggested an Unbirthday party instead. After the party Mickey stayed to clean everything up by putting on his wizard clothes and summoning a bunch of iceskating brooms. The next celebration was Halloween (because Halloween is totally on Valentine’s Day in February). After Halloween came Valentine’s Day. Finally! Minnie was looking for her love, but couldn’t find him. All the Disney princes and princesses tried to help out by dancing around a fountain. Most of the traditional amazing ice skating moves were during this number. 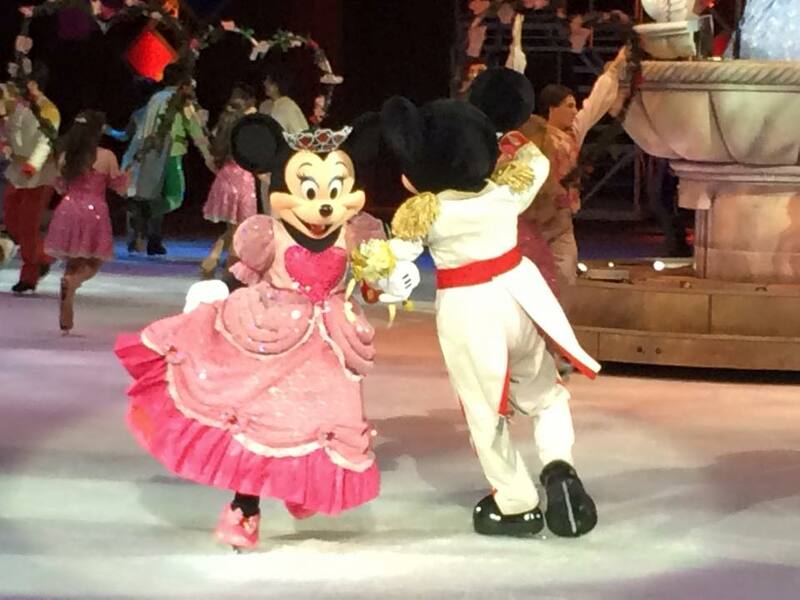 Lots of princes lifting princesses and dazzling spins on the ice. In the end Mickey was inside the fountain that Disney royalty was dancing around. He came out and had a dance with Minnie. Hu-Ha! Let’s get married, Minnie! After the Valentine’s Dance there was an intermission followed by Mickey’s fantastic travel the world second act! If you’ve been to Disneyland and seen the Magical Dot show, it’s almost the same thing. Asia, Agrabah, all over Europe, New Orleans, and Hawaii! Hawaii was the best of all. A man came out and sprayed some liquid onto the ice. 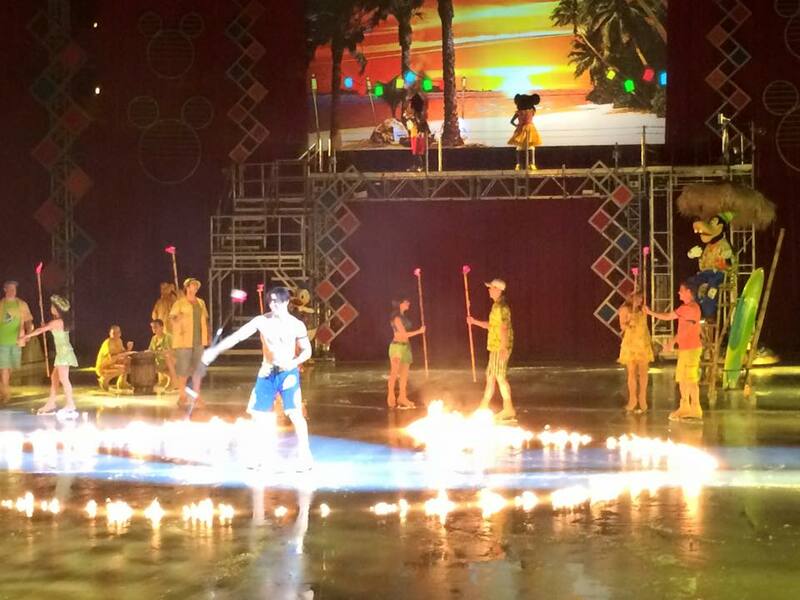 Then the male lead from Lilo and Stitch came out with a fiery baton and lit the liquid (gasoline) on fire! Pyrotechnics are hard to capture on film beca-THIS SHOW IS COPYRIGHTED BY DISNEY! And then the show ended with the required big finale where all the characters came out to sing and make merry. 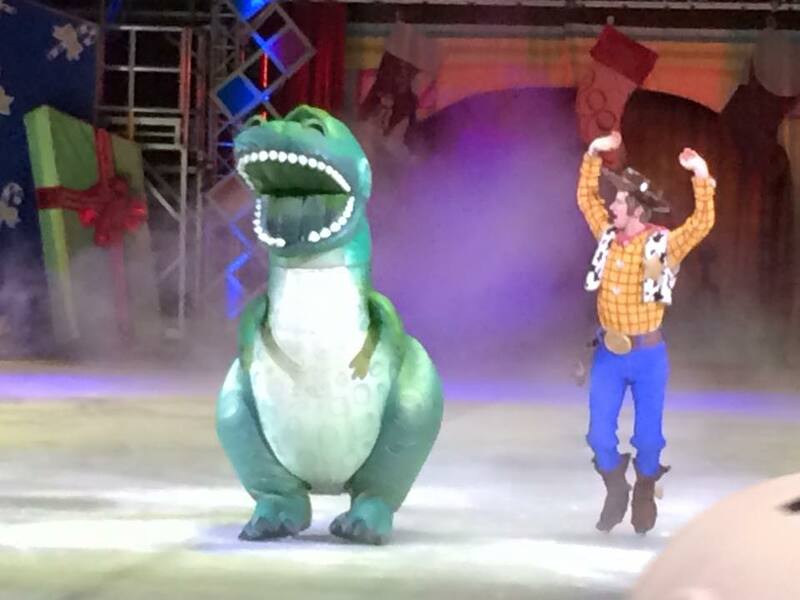 I know what you’re thinking and no, Woodie did not make merry with the dinosaur. Pretty cool date! Definitely glad that we went. I’m going to talk about the latest video game sensation! Not League of Legends! Not Hearthstone! That’s right! You guessed it! 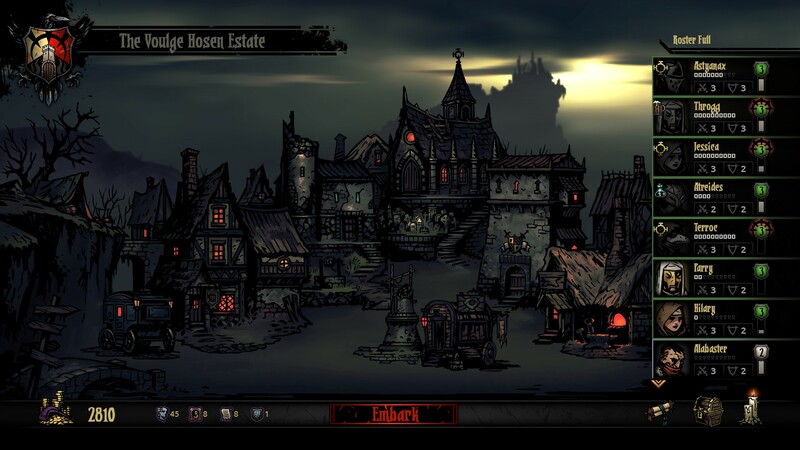 The Darkest Dungeon. I… I… I can’t read. 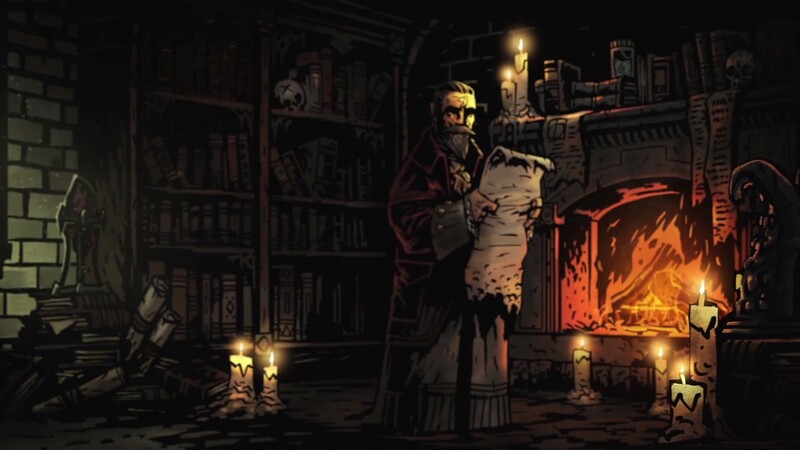 Darkest Dungeon is an indie game funded through Kickstarter. 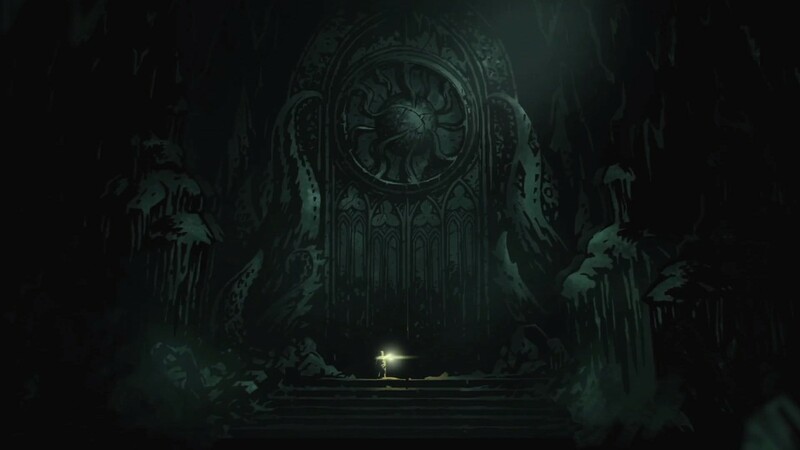 In the game a wealthy socialite turns to the Cthuluian mysteries for entertainment and he unlocks horror beneath his mansion. The evil spreads until the entire countryside is corrupted by monsters, cultists, and brigands. Beware! This game uses fancy words like antediluvian and tenebrous! The player controls various groups of adventurers hired by the caretaker of the mansion to rid it of the abominations that inhabit it. The game is a fairly typical turn-based RPG. Positioning of your party members is also important, but there’s nothing new there. 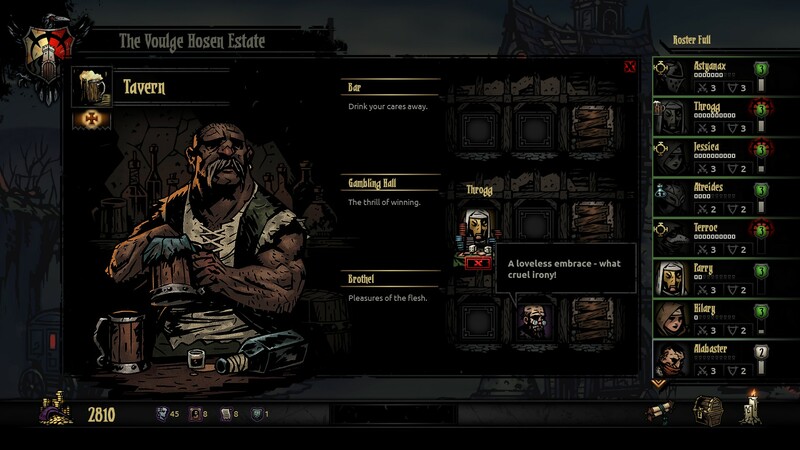 The new mechanic in Darkest Dungeon is the stress bar. If you’ve read the short stories by HP Lovecraft that inspired this game, then you’re familiar with how the characters go insane when exposed to otherworldy horrors. Well, the same thing happens to the adventurers you control in Darkest Dungeon. Getting hit really hard by monsters drives your party crazy. When the monsters do creepy things your party goes crazy. When the torchlight starts burning low your party goes crazy. All that crazy is measured by the stress bar which goes from 0-100. 0 is fine, 100 is insane. There’s other cool stuff too. Every class gets special attacks and you can name all your characters, like Snoop Dog in that picture down there. In between adventures your party can rest and recuperate from all that craziness. There’s plenty of buildings to upgrade in the little town you stay in and the gold you bring back can be spent to improve your adventurers’ abilities for future dungeon raids. It was a dark and deluvian night. And best of all, the adventurers talk throughout the whole game. Here’s your boss, the caretaker, describing one of his favorite places to visit in town. Caretaker’s getting jiggy with it. I like to gauge entertainment on a ratio of hours of entertainment to money spent ratio. Movies are $10 to 2 hour ratio. 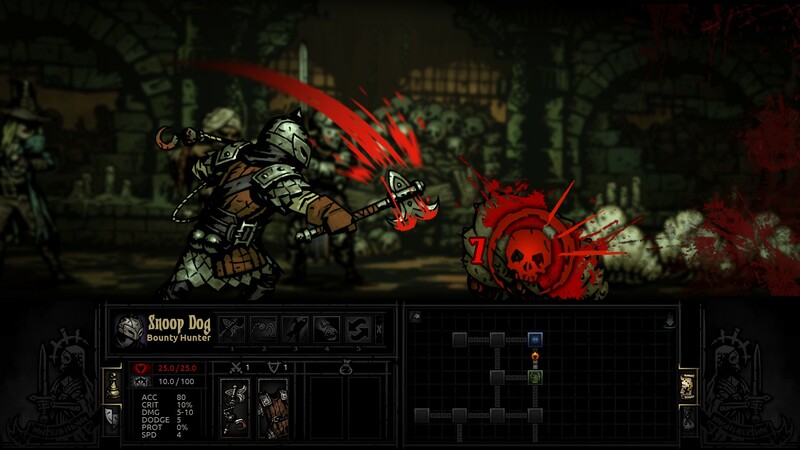 Darkest Dungeon is $20 to… probably about 100 hours? That makes it 25 times as much entertainment value as a movie! Not necessarily as much fun packed into two hours, but over time it’ll appreciate into something you can really enjoy. Check it out on Steam now! 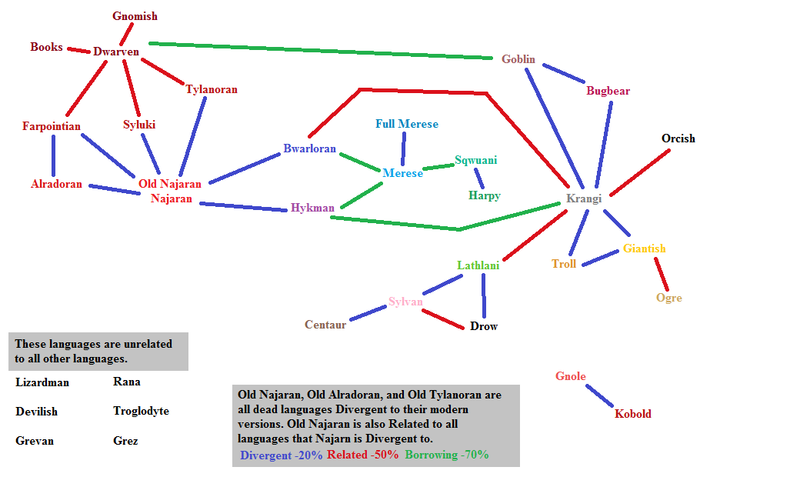 Last night I made a map representing the relationships between different languages in Gurutama. Since I am playing on using the Hackmaster rule system for Gurutama I modeled the relations between the languages on how languages work in Hackmaster. Languages are treated as skills in Hackmaster with proficiencies ranging from 0-100%. 0-25% is when you know a few words in the other language. Most Californians have at least this much understanding of Spanish. 26-50% is when someone knows how to construct sentence frames, but can’t really carry a conversation. Someone who’s still learning the language. 51-75% is when someone knows enough to go on vacation to another country and speak that country’s language, but not enough to have a conversation about philosophy or something. My wife and I probably have this level of proficiency with Spanish. 76-87% is a normal mastery of a language. Hackmaster treats this level as the amount most people have in their native language. 88-100% is when someone knows lots of fancy words in their language. My dad has a PhD in linguistics, so he probably falls into this range. That should give you a better idea of what the penalties listed in the image above mean. Lets say that English is Merese on that map up there. My dad with his PhD in English linguistics would have around 20% mastery of a language that English borrows words from, like Swedish. He’d recognize a few cognates between the languages and he might know how to construct sentences, but he can’t really speak Swedish. I’d guess that I have around 60% proficiency in Spanish. French is a very similar language. Everyone else in my family spoke French occasionally when I was growing up and the little bit of Spanish I know allowed me to understand the gist of the conversation even if I couldn’t participate. French and Spanish would be considered divergent languages in the Hackmaster system (along with Portuguese, Italian, Romanian, etc.). A few of the languages up there might not be recognizably from Gurutama. Some of those are for monster races like trolls, giants, and orcs. The others, like Krangi, Lathlani, and Sqwuani, are for a few of the main races. Krangi is Hobgoblin, Lathlani is Elven, and Sqwuani is Avian. The other members of my D&D group are getting a little more interested in Gurutama lately and there was talk of setting up a wiki for the campaign setting so everyone could edit and add stuff on. If the wiki is set up I’ll start moving content there. The stuff I create will still be posted here but my friends can’t make the same promise. 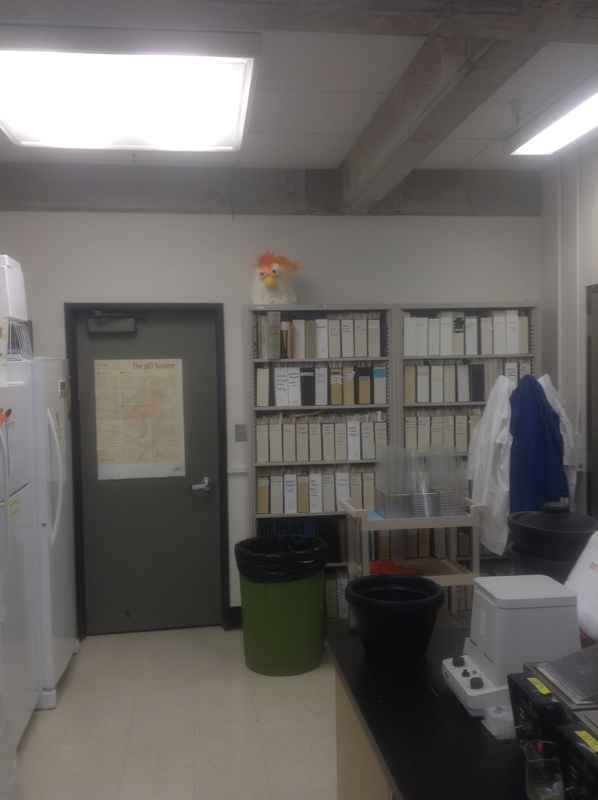 All labwork is overseen by the disembodied head of Muppet lab assistant, Beaker. I have begun my Master’s project in earnest and the goal is slightly different than what I’d been doing before. First, I’ll repeat myself. I’m a biologist and I work with introns in C. elegans. 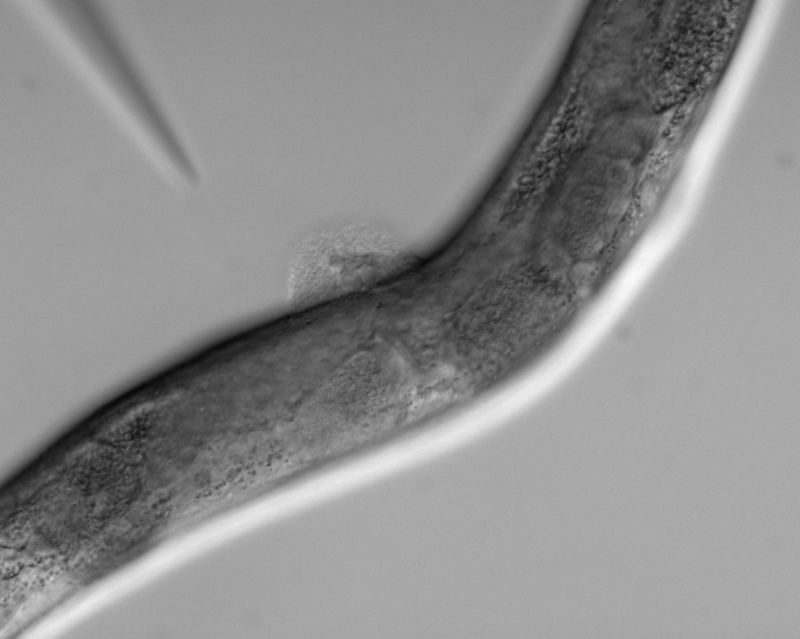 C. elegans is a type of nematode worm that naturally lives in soil or on rotting vegetables. It is also one of the most widely used model organisms for biological research. Introns are unused sections of genes. You’re probably aware that DNA is in our cells and contains the instructions for how an organism functions. The human genome contains around 25,000 genes and those genes are split into two parts, introns and exons. Exons are the part of that gene that are actually used to produce things in your cells, while introns are spliced out and removed. So why are introns on there at all if they’re removed? Well it turns out that some introns increase expression of the genes they’re in. 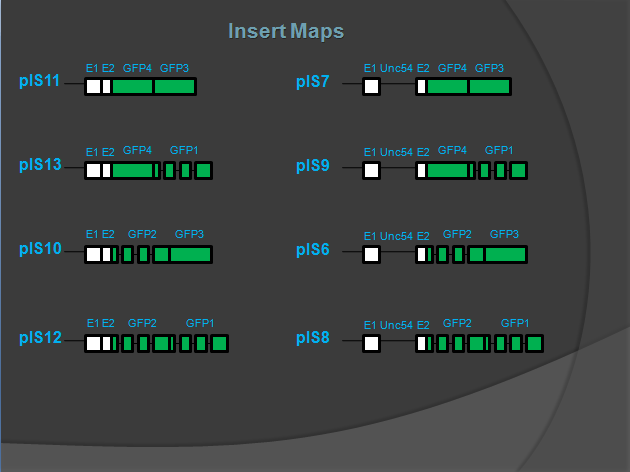 My project looks at how placement of those enhancing introns affects expression. Experiments in plants have shown that an enhancing intron works best when it is placed near the start of a gene. Experiments in C. elegans have suggested that, but no experiment has outright proved it. My project will hopefully do that. I’m measuring the expression of genes according to how introns affect them, so I get to pick which gene to use. When picking a gene like this scientists often pick what are called reporter genes. The expression of these types of genes is easy to measure, often because they have produce light or fluorescence of some kind. The light tells you whether the gene is on, but also at what level it is turned on based on how bright the cell is. Previously I was using a reporter gene called GUS. GUS is an enzyme that digests a specially prepared sugar, releasing a blue chemical that was attached to that sugar. The blue chemical is then visible to the naked eye. There were a number of problems with that experiment though. First, adding the sugar chemical to the worms was a pain, taking about three days to set up and look at. Plus, the blue color was difficult to measure precisely because most of the machines in the lab are set up to measure red or green colors, not blue. Finally, GUS is traditionally a reporter gene for plants, not C. elegans. This could’ve been introducing other problems that we couldn’t easily identify. Thus the use of the GUS reporter gene has been scrapped in favor of another reporter gene. I’ll be using Green Fluorescent Protein (GFP) as my reporter gene now. GFP is widely used in C. elegans and many other organisms. The protein created by the GFP gene glows green when you shine a red light on it. Very easy to see and measure. None of that three day procedure for GUS. I just pop the worms under the light and take a look. Why weren’t we using this procedure before if it’s so easy? Two reasons! Reason number one: C. elegans won’t express GFP without introns in the gene. So does that mean we proceed and hope one intron is enough or do we add the standard amount of introns to get expression? I’ve decided to see what the GFP looks like with the standard introns scientists put in it for C. elegans and without them. I’ll also be testing with an added intron. The whole thing is a little complicated so here’s a diagram to explain. Here are the constructs I’ve been creating. The wide parts are exons and the thing parts are introns. The green bands are the GFP which will glow green in the worms. The white bands are a scaffold which allow the worms to express GFP. There are eight different constructs I’m making. They are a combination of three different features that are present or not. Are there introns in the first GFP? Yes or no? The second GFP? And is the Unc54 intron there? This allows us to control for the positional effect the standard introns in C. elegans GFP. Reason number two: Those eight constructs above? Those aren’t made yet! All the GUS constructs were made when I started the project. I’ve been working on making the new constructs for a few months. It could take a few more months to finish. So my project is to make those constructs, put them into worms, and then see what the worms look like. As I perform these steps I’ll make more posts about what work I’m doing in lab and why its so cool. My wife and I have been thinking about buying a house for awhile and over the last few weeks we have set things in motion for us to actually get one. The first thing we did was to call a real estate agent that had gotten a house for a couple we’re friends with. The real estate agent set us up on a tour of houses in Davis in what we’d guessed our price range was. We fell in love with the first house we saw and none of the other houses compared to that one. The house itself has four bedrooms and two full bathrooms. 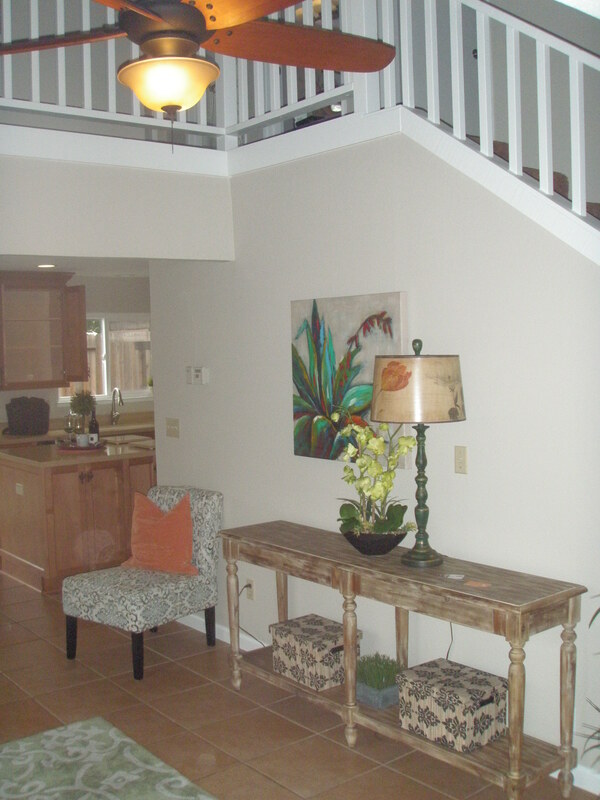 There’s an additional room upstairs that is designed to be an office space. There are two living rooms, a back patio, and a side patio. 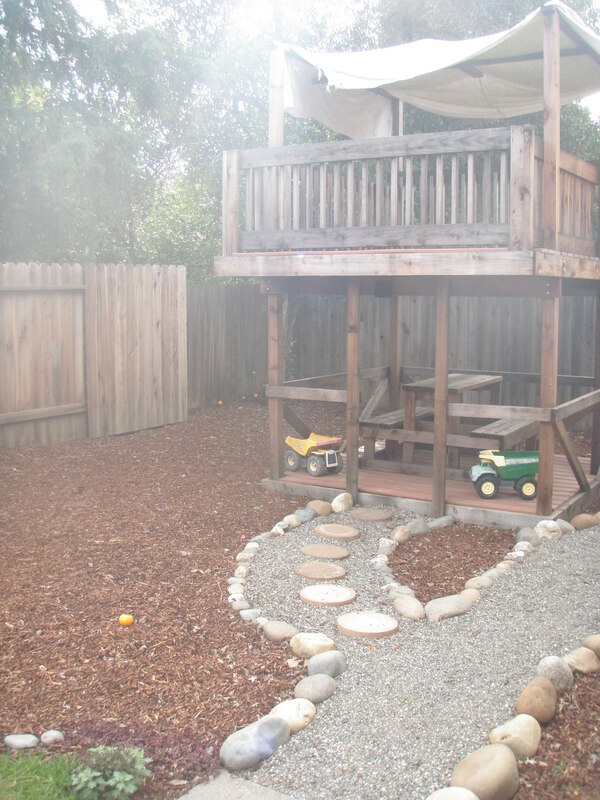 The kitchen is massive and there’s also an awesome play structure in the backyard. On top of the roof are some solar panels. The house is at the end of a block long cul-de-sac and right next to a park at the back of the street. Basically, the house is amazing. We fully believe that we could live in the house for the next forty years. So after deciding we wanted to make an offer on the house we had to go through a flurry of gathering papers and sending them off to the lender to get us a mortgage. Bank statements, loan statements, W2s, paystubs, credit card statements. SO MANY STATEMENTS! We quickly got a prequal letter for a mortgage and we made an offer on the house. 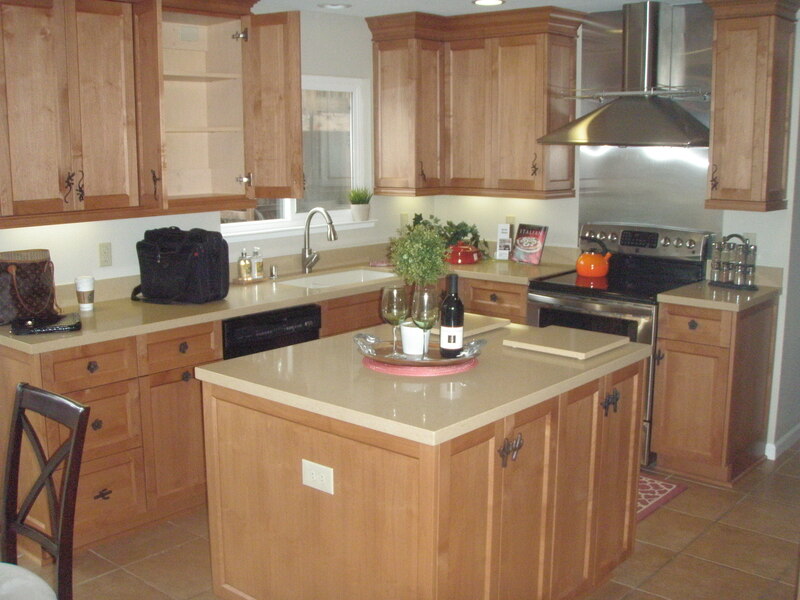 The house had been on the market for five months, so initially we were going to lowball it. But apparently two other couples had gone to the open house and were going to make offers on the house as well. We went for list price and the current owners snatched our offer up the next morning. The next step was lining up house inspections to make sure we weren’t getting a dud of a house. The inspections happened this week. They found a few problems, but nothing major (no walls made of cardboard, no explosives under the floorboards, etc.). We’re asking the current owners to fix some of the problems before we close escrow. There’s been a steady stream of other forms to sign going back and forth between my wife and I, the real estate agent, the solar company, our insurance company, and the lender. It’s been an exhausting experience. When I get home I’m often printing off another form to sign, signing it, scanning it back into my computer, and then emailing it off again. The process would probably be even more exhausting 25 years ago when the forms all had to be dropped off in person or sent through snail mail! But we’ve lined up an amazing house to move in to. Here! Take a look! The view when you first come into the house. 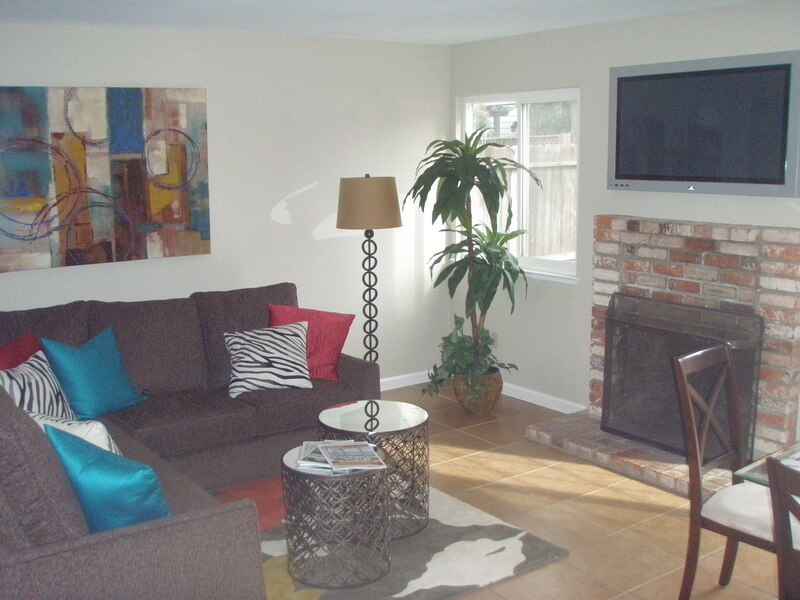 One of the TWO living rooms. I will climb on this thing every day once we move in. Looks like I’m going to write something political again because today President Obama asked the US Congress to declare war on the Islamic State of Iraq and Syria (ISIS). ISIS is a group that grew out of al-Qaeda in northern Iraq. Since its impossible to truly wipe out a terrorist group, they continued to operate during US occupation and after Bin Laden’s assassination. When the Syrian Civil War broke out in 2011, ISIS took advantage of the situation and moved into eastern Syria. ISIS has since absorbed or eliminated most of the other rebel groups in the Syrian Civil War, making the Civil War essentially a fight between Assad’s forces and ISIS. The US has been providing training and weapons among other things to the original Syria government led by Assad. The US has also been helping Assad with bombing raids and drone strikes on ISIS targets. That’s about the limit of aid Obama can provide without going to war. The congressional acts that allow the war on terror don’t allow the President to deploy soldiers directly on the battlefield in Syria without a declaration of war from Congress. Obama is now asking for that declaration. Congress has said they will debate it and the discussion could take months. Congress has been quick to declare war in the past when the President requests it, making the very existence of debate a sign that the USA probably won’t go to war. And I don’t think we should be going to war with ISIS. There are good reasons for going to war against ISIS. The group/country’s leaders are despotic theocrats. Going to war against ISIS could also lay the groundwork for forming the nation of Kurdistan for the Kurd population in Turkey, Syria, and Iraq. The Kurds have long been discriminated against either directly or through gerrymandering as a racial minority in the other countries, but that could change if they were given their own country. So all that stuff is well and good. The UN is involved for those reasons. But why is the USA involved? What do we get for declaring war on ISIS? Well, we help out US allies, Iraq and Israel by keeping the region temporarily stable around them. But we have allies for reasons right? What do Israel and Iraq give us in exchange for this help? Well… As far as I can tell, they give us space to build military bases so that we can keep a presence in the Middle East region. And that presence is needed so that we can protect Israel and Iraq. I’m sure there are other reasons besides that, but that’s how it looks to me. Another issue with helping the Syrian government is that we are helping Assad, a hereditary dictator. We call him President of Syria instead of King of Syria because it is polite to do so, not because he actually won any fair election to the presidential office. Those are the big points on the topic that I’ve landed on when debating with myself. My opinion is that the USA should not go to war in Syria. In fact, I wish we’d provide less aid to Assad by not bombing or performing drone strikes as those harm civilian lives. But as with everything political, the situation is more complex than that. Would allowing ISIS to freely take over Syria result in the loss of more civilian life? Maybe. My ill-informed mind can’t provide all the answers on this topic, so I’d encourage you to learn more on your own by visiting CNN’s website. They have a lot of cool videos that can tell you more.